Representing four decades in creative forward-thinking music internationally, NYC Guitar Studio-also simply known as 'Sten's Guitar Studio' is the educational incarnation of acclaimed guitar virtuoso, multi-string instrumentalist, composer, bandleader and veteran educator STEN HOSTFALT's work as a pioneering solo performer, composer, bandleader, producer and academically at some of the worlds premier institutions for music education, all built on his early 1990's introduction on the New York City /International Jazz scene, facilitated via studies, performances and collaborations with legendary icons of American Music Horace Parlan, Jimmy Giuffre, Paul Bley, Gary Burton, Peter Erskine, Clare Fischer and Joe Maneri. 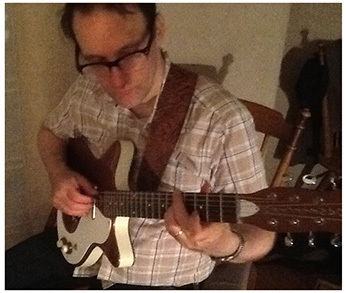 Sten Hostfalt is a leading innovative guitarist and composer working on the New York music scene of today. He performs with some of the most original and unique voices in modern music and has been called 'highly exceptional' by legendary American music icon Jimmy Giuffre and 'virtuosic' by musical innovator Joe Maneri writes one of the world's foremost thinkers on guitar and pedagogy-Berklee College of Music professor Jon Damian in his book 'FRESH MUSIC : Explorations with the Creative Workshop Ensemble for Musicans, Artists, Teachers' where he re-iterates Hostfalt's 2006 microtonal music guest lecture at Damian's Berklee Creative Workshop, a creative format where the students past four decades has included Bill Frisell, Jeff Parker, Kurt Rosenwinkel, Wayne Krantz, Leni Stern and Mark Whitfield. Sten Hostfalt has developed his own repertoire incorporating microtones-a genuinely innovative approach, in the future 29 Pieces for the Microtonal Guitar may be be considered a groundbreaking work wrote Don Williamson in his 2005 JAZZ REVIEW feature of Sten Hostfalt's solo album 29 Pieces For The Microtonal Guitar Live at Knitting Factory New York, released in 2002, at at the heels of his Paul Bley initiated debut CD and devoted to exploration of the paramenter of pitch inspired by mentor, visionary composer Joe Maneri's 72-note Equal Tempered Virtual Pitch Continuum. The innovative impact of the work, performed solo and live in one single take on electric and acoustic guitars and electronics was lamented by ALL ABOUT JAZZ senior editor John Kelman " Sten Hostfalt takes the rigid confines of the Guitar and transforms it into an instrument capable of exploring the minute spaces between traditional notes by using altered tunings, mechanical preparations and electronically enhanced techniques. The result, 29 Pieces for the Microtonal Guitar, is an intriguing recording that shows just how far an instrument can be bent and altered to meet a more experimental and adventurous need, taking you on a journey to a place where rules simply don't exist. For those with ears broad enough to allow for the possibility that music can extend beyond the expected, and expand the potent boundaries of experience." 'A bunch of A-list adventurous Jazz types play Sten Hostfalt's microtonal Dimensional States for Orchestra' - NEW YORK MUSIC DAILY 2014 - The current ( as in past 10 years ) manifestations of Sten Hostfalt's four decade participation in and active contribution to the global jazz, improvised and creative music scene in appearances at leading concert stages, alongside some of the world's most innovative musicians for four decades, notably include the 2014 world premiere solo concert performance of his original work Four New Microtonal Pieces at the XXXV Encontre de Compositors Festival at Pilar i Joan Miro' Mallorca Spain, the 2010-11 solo concerts at New York's Symphony Space and his 2014 original microtonal ensemble work Dimensional States for 13 musicians and 2 dancers, twice at ShapeShifter Lab NYC, all follow the path set by the 2002 solo concert recording 29 Pieces For The Microtonal Guitar Live at Knitting Factory New York, critically regarded a seminal work for microtonal music on the traditional 6-string / 12 fret guitar. Jazz Now Magazine has compared Sten Hostfalt to John Fahey and Derek Bailey. Guitar Player's 'Rants & Raves' column placed his microtonal solo work next to 'The 21st Century Guide To King Crimson'. While Cadence pointed out Captain Beefheart and Jimi Hendrix influences. Since the debut CD's, Mr. Hostfalt has produced six recordings as a leader, and on his own label, in the process, enlisting engineers Greg Thompson ( They Might be Giants, David Byrne, Lady Gaga, Beyonce, Alicia Keys, Justin Bieber, Korn ) Doug Henderson ( Anthony and The Johnsons, Devendra Banhart, Swans, Sleep, System of a Down ) and Eric Tew ( Super Furry Animals, Ted Leo, Boss Hog, Dixie Chicks, Sheryl Crow, Phife Dawg, Fountains of Wayne ) and worked in some of New York City's most influential studios of the new millennium such as Micro-Moose Brooklyn and Kampo Audio, and internationally at Le Triton, Les Lilas, France and in the Swedish Radio studio, by way of a string of artist and tour grants awarded by the Swedish Cultural Council for The Arts. Sten Hostfalt's RECORDINGS as a leader have featured bass guitar virtuoso Matthew Garrison ( Joe Zawinul, John McLaughlin, Herbie Hancock, Joni Mitchell, Steve Coleman, Whitney Houston, Chaka Khan ), trumpet player Takuya Nakamura ( Quincy Jones, GZA of Wu Tang Clan, Lee 'Scratch' Perry, Brazilian Girls, The Streets, CoCo Rosie ) drummer Marko Djordjevic and tenor saxophonist Matt Renzi. His PERFORMANCES as a LEADER of the groups G-Factor ( Ghost Factor ), K-MOD, Soft Value, Sten Hostfalt Trio / Quartet and his large microtonal ensemble with dance Dimensional States, has during the past three decades hosted bassists Tim Luntzel (Norah Jones, Rosanne Cash, Pete Seeger, Neil Sedaka and Lee Ranaldo), Richard Hammond (Joan Osborne, Erasure, Angelique Kidjo), Matt Pavolka (Lee Konitz, Elysian Fields ) Masa Kamaguchi and Shayna Dulberger, saxophonists Ole Mathisen (Randy Brecker, Dream Theater), Down Beat 2017 rising star on Tenor Sax Noah Preminger (John Patittucci, Matt Wilson) and Seamus Blake ( John Scofield, Dave Douglas ), drummers Jimmy Weinstein, Blake Lindberg, Dave Miller, Owen Howard, Federico Ughi and Cyril Atef (Cheb Mami, Salif Keita), vibraphonist Tom Beckham and vocalists Melissa Kassel, Liliana Santon and Constance Cooper. As a SIDEMAN, currently ( as in the past decade ) Sten Hostfalt has contributed to the new generation in electronica through live performances with CALMER AKA Collin Palmer, as an electric bassist in shared events with Praveen, Travis Stewart AKA Machinedrum (Azealia Banks, Jesse Boykins III), Theophilus London (Warner Bros, Kanye West, Rihanna), Keith Murray (DEF Squad), Addiquit and MOBY. In addition to playing bass with King Bato 'The Yugo' Andonov's Gypsy Boogie at East Village club Nublu. As a featured guitarist in drummer Marko Djordjevic's fusion band SVETI, he has performed with young jazz fusion talents Nir Felder, Janek Gwizdala and Brad Mason (Blood Sweat & Tears). Membership of New York's 'Downtown scene' (ever since playing 'old' Knitting Factory with Guillermo Klein in 1995) includes over 70 performances, and the CD 'Now Matter' with saxophonist Blaise Siwula (Cecil Taylor, William Parker) and shared live events with Tim Berne, Daniel Carter, Bern Nix, Ray Anderson, Herb Robertson and Bob Stewart. A naturalized American citizen and long time New Yorker, Sten Hostfalt was born into a musical family in 1962, in the remote northern industrial town of Luleå Sweden. He picked up the guitar at 10 and largely self-taught joined his first band three years later, taught his first lesson while still in high school, engaged in formal classical guitar studies at age 16 and appeared as a soloist, composer and co-leader on his first released recording in 1982. A decade later, via membership in Phil Wilson's Big Band, he made his CD debute, as a featured soloist with Herb Pomeroy's Berklee Concert Jazz Orchestra, known as 'The Recording Band' and famous for the 'Jazz in The Classroom' recording series that since the 50's featured Joe Zawinul, Branford Marsalis and Quincy Jones. In addition to stint in New England Conservatory's NEC Big Band (briefly under George Russell) and other NEC ensembles, where bandmates included Cuong Vu (Pat Metheny Group) and Jamie Saft (John Zorn, Iggy Pop). In Boston btw 1989-94 Hostfalt also performed live in concert with Gary Burton, Peter Erskine, Clare Fischer and with mentors Jimmy Giuffre and Joe Maneri, participated in masterclasses with Toru Takemitsu, Larry Coryell and Pat Metheny, studied guitar with Mick Goodrick and had his first recording as a leader initiated by mentor, avantgarde icon Paul Bley. The Recording band-including saxophonists Seamus Blake, Chris Cheek, Melvin Butler, Mark Turner and Dan Bosshardt, trombonists Sandro Tomasi and Matt Pavolka, drummer Marc Miralta, trumpet players David Boato, Richard Nant, Juan Cruz de Urquiza and Diego Urcola, along with Boston pianist Aaron Goldberg, eventually became the first edition of composer Guillermo Klein's ensemble, in Boston from 1992 and in New York between 1994-95, Hostfalt was a member of Klein's band in weekly gigs at NYC Jazz Club Smalls, and on the bands '94 CD 'Big Van' ( 'El Minotauro' ) and shared the praise extended to them by Jazz Times Magazine, All Music Guide and New York Times who called the band 'Unlike Any Other-One of The Better Continuing Experiments in New York'. Before leaving Klein's band ( and passing the chair to in turn, Kurt Rosenwinkel and Ben Monder ) to tour in Scandinavia with Swedish Sandviken Big Band, in support of mainstream Jazz artists Rob McConnell, Bobby Shew and Deborah Brown at leading concert halls and in shared festival events with Ray Brown, James Moody, Phil Woods, Tower of Power, Woody Herman Big Band and Niels Henning Orsted Pedersen. As an educator Sten Hostfalt has served as a teaching faculty member of one of the worlds oldest conservatories, KMH The Royal College of Music in Stockholm ( 2001-05 ) and as a lecturer at New World School For The Arts at Miami-Dade College / University of Florida ( 2010 ), and Berklee College of Music ( 2006 ). He holds a Master of Music Degree in composition and a Graduate Diploma in Performance with honors from New England Conservatory as well as a Bachelor of Music Degree with honors and an Outstanding Musicianship Award from Berklee College of Music. Since 2009, Mr. Hostfalt is a teaching faculty member of New York Jazz Academy 'one of the fastest growing music schools in New York' (Down Beat) where collegial duties and student-faculty performances have included samong others saxophonist Wayne Escoffery, guitarists Tom Dempsey, Miles Okazaki and Brad Shepik, bassists Jonathan Toscano ( Omar Hakim ) and Ron McLure ( Charles Lloyd, Wes Montgomery, Quest, Blood Sweat & Tears ) and pianist Adam Birnbaum, and performed in student-faculty concerts at Carnegie Halls Stern Auditorium ( 2010, 2014 ). Via his own Manhattan music education operation, Sten's Guitar Studio ( NYC Guitar Studio ) a divison of his NYC registered music production business Sonus Rex ( established 2006 ) Sten Hostfalt has coached students enrolled at Juilliard School of Music, Columbia University, Rockefeller University, New York University, Fiorello LaGuardia High School For The Performing Arts, Third Street Settlement and Willie Mae School of Rock For Girls. Schools and organizations catered to in the process include First Flight Music School ( 2007-15 ), Queensborough Youth Conservatory at Queensborough Community College, City University of New York CUNY (2010 )* Kingsbridge International High School Bronx NY ( 2010 ), * DISCLAIMER : Sten Hostfalt, Sten's Guitar Studio/NYC Guitar Studio/Sonus Rex are not affiliated with Queensborough Community College or The City University of New York CUNY. Former students have notably been prepared for and accepted into academic music and performing arts programs at Berklee College of Music, SUNY Purchase ( State University of New York ), The Special Music School High School program at Kaufmann Center New York, Eastman School of Music, The New School for Social Research NYC, Manhattan School of Music, Bard College, Western Illinois University WIU and KMH Kungliga Musikhögskolan The Royal College of Music in Stockholm. And gone on to careers as prolific music industry professionals appearing at major concert venues and record labels worldwide. Coaching of established professional major label as well as indie label contracted touring and recording artists include members of The Strokes, Afghan Whigs, Titus Andronicus, Okkervil River, La Otracina, Mirror Queen, Psychic Twin and Barnum & Bailey's Ringling Brothers Circus. Building on Sten Hostfalt's longtime systematic dedication to and subsequent recognition for work with expanding the resource and techniques for one of the world's most popular, most played instruments-the guitar, and specifically so via exploration of the parameter of pitch, Sten's Guitar Studio is known as one of few forums worldwide offering systematic studies of microtonal music on the traditional, standard 6-string, 12-fret guitar. While in the corporate world, currently being a member of leading string manufacturer D'Addario's Educator Collective and having been enlisted to provide music education services for the worlds leading music instrument retailer Guitar Center. Mr. Hostfalt is a current, active member of pro musician organizations BMI Broadcast Music Inc. and AFM American Federation of Musicians, Associated Musicians of Greater New York, Local 802. With former ( as in past 20 yrs ) musician / educator organization memberships including STIM and IAJE International Association of Jazz Educators. recording artist, professionally affiliated with Broadcast Music Inc. ( BMI ) and Associated Musicians of Greater New York, Local 802 of the American Federation of Musicians, and enlisted all according to contracts accordingly.